Less than 2 km long and 500m large: Sein Island is a small entirely totally disconnected from the mainland. With its own electrical system, the island was totally powered by diesel generators until the beginning of 2017. Faster than anywhere else, the islanders became aware of the consequences of climate change, especially the rising water that could flood this piece of land if nothing changes. The need for a radical energy transition is obvious. Therefore the local community was eager to take up the challenge early, more than ten years ago, with energy efficiency measures led together with EDF. Sein Island was the first French municipality to be fully equipped with LED public lighting, resulting in an 80% decrease in public lighting energy consumption. A first PV rooftop and a self-consumption building kicked off the development of renewables on the island in 2016. Since then, very ambitious objectives have been set: renewables shall cover 50% of the electrical needs by 2023, and reach 100% in 2030, making this territory a pioneer and a reference for the rest of the French electrical system. Currently, around 130kW of photovoltaic rooftops are connected to the grid, and a 250kW wind turbine is expected in the next two years. However, the equation is not so simple. The population on the island fluctuates as much as the tides: 120 inhabitants in winter, up to 1500 during the summer period. The electrical system will have to cope with a combination of renewable energy intermittency and rapid load fluctuation. 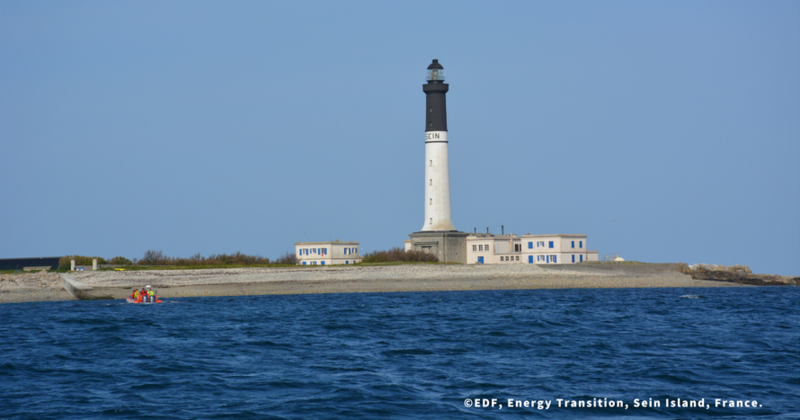 With its expertise on micro-grids, EDF SEI helps Sein island to take up this challenge. An innovative architecture, developed in collaboration with EDF R&D, enables the insertion of renewables in the grid with the help of a storage system to adapt, offer, demand and ensure the security of power supply. The solution is based on a centralised storage system installed together with an intelligent control system, developed by EDF’s affiliate EDF Store & Forecast. A first 200kW/180kWh li-ion battery was installed in May 2017, enough to enable the target of 50% renewables when the wind turbine will be connected. The energy optimisation software (Energy Management System) monitors and controls in real time the generation and storage units, and can control other flexibility resources as well, such as demand management. The solutions of this unique project in France could afterwards apply to other micro-grids or non-interconnected areas.